Facebook Messenger can do so much more than send texts. 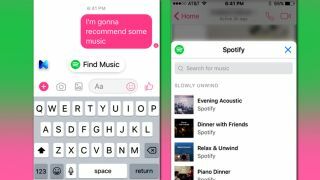 In addition to video chats, conducting polls and even playing games, the messaging app's next trick is knowing when to suggest tunes from a little service known as Spotify. Mentioning music on Facebook Messenger now prompts music recommendations from Spotify, allowing users to browse a truncated version of the mega-popular streaming service to find just the right jams for their chat. The feature seemingly comes courtesy of M, Facebook's built-in assistant for Messenger, which picks up on certain phrases like "get a ride" to summon a car, "pay you back" to offer payment services or, in this case, "play/recommend some music" to bring up Spotify. While Spotify users have had the ability to share links on Messenger for over a year, the app now appears to just know to bring up the streaming app whenever you chat about the latest playlist you made or that sweet new Kesha release. We can independently confirm that M's Spotify recommendation feature works on the latest version of Facebook Messsenger on iOS, but may still take some time to roll out to all devices and platforms. In the meantime, we weren't kidding about that Kesha album — it's so worth checking out.